Before the man was deposed, Egyptian President Mohamed Morsi was roundly derided for ramrodding through a new constitution that would have, as his critics charged, made Egypt into an illiberal theocracy. Of special consternation was its second article, which declared that “Islam is the religion of the state and Arabic its official language. Principles of Islamic Sharia are the principal source of legislation.” But when Egypt’s next constitution, shepherded in by the military and ratified as Morsi stood trial, was found to contain nearly-identical language, the bells of discontent were not rung quite so loud. Religious clauses in constitutions have abounded in Muslim countries, whether ruled by monarchs or mullahs, presidents or prime ministers, ever since Syria’s 1950 post-colonial constitution declared Islamic jurisprudence to be the basis for legislation. Over half the constitutions of Muslim-majority states today contain similar clauses that officially recognize Islam. The motivations and practical effects, if any, of these declarations have been hotly debated, but all agree that wording matters. Sharia can be described as “a principal source” of legislation or “the principal source”; Islam is either labeled as merely supreme or laws deemed repugnant to it are made explicitly invalid. 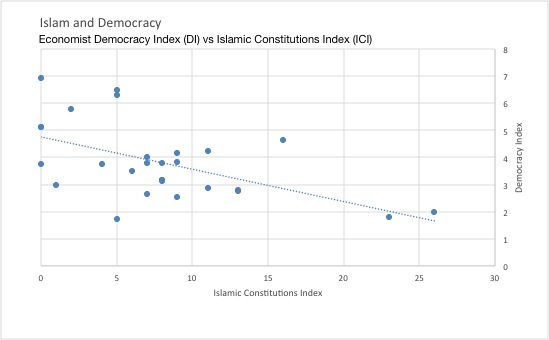 Are democracy and constitutional Islam at odds? It’s a complicated question, sure to be bandied about in the halls of the academy. But an empirical approach to this question can also be worthwhile. 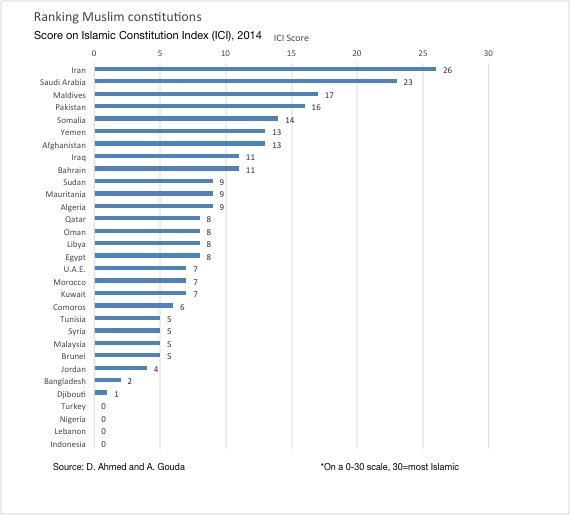 One helpful measure is the Islamic Constitutions Index, developed by the academics Dawood I. Ahmed and Moamen Gouda, which assesses the degree of Islamic endorsement by constitutions on a scale from zero to 30 based on the demands made on public morality, rights and legislation, and the judiciary. Topping the chart, perhaps not unexpectedly, are regional rivals Iran and Saudi Arabia, the first a Shia theocratic quasi-democracy and the other a Sunni monarchy. But immediately following them are the Maldives and Pakistan, two democratically governed countries with moderate civil rights protections—not quite as renowned for morality police or punishments like amputation and beheading. Avowedly secular Turkey scores a zero, but so does Indonesia, the country with the world’s largest Muslim population. 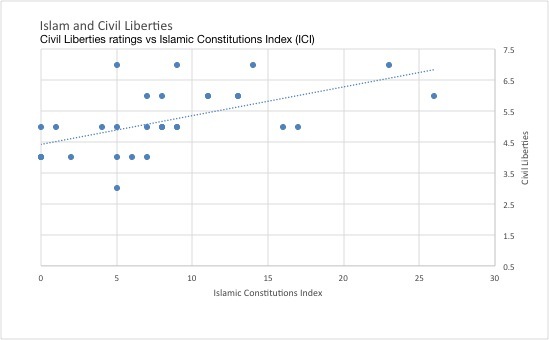 Comparing the level of constitutional Islam for Muslim countries with other published indices for levels of freedom and democracy yields dispiriting results for proponents of constitutional Islam. 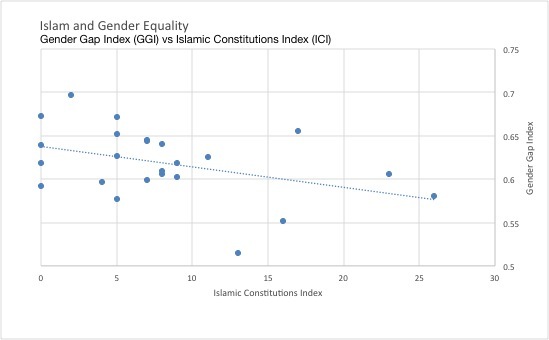 On average, constitutions with higher measures of Islamic provisions in their constitutions are associated with worse scores in The Economist Intelligence Unit’s democracy index, Freedom House’s civil liberties ratings, the World Economic Forum’s gender gap index, and the Pew Research Foundation’s index of government restrictions on religion. Meanwhile, Western nations were recently involved in rewriting the Iraqi and Afghani constitutions, both of which prominently enshrined the position of Islam. Does this analysis affirm the warning that “the elevation of Iranian-style theocrats,” as one critical academic put it at the time, would undo the democratic order? Here, the familiar chiding about correlation and causation need be remembered. Between the high-minded sphere of constitutional design and actual, day-to-day impact on residents lies the apparatus of censors, judges, and policemen who modulate constitutional demands and translate them for the common man. What constitutions prescribe and what bureaucracies end up dealing out can be quite different. Though constitutionally secular, Indonesia has strong anti-blasphemy laws and government-sanctioned persecution against religious minorities. Academics have also proposed explanations for these Islamic provisions that could complicate matters. So-called “repugnancy clauses,” which invalidate laws judged contradictory to Islam and are perhaps the strongest endorsements of religion, are thought to have originated with British rule of India, when the imperial government gave itself the power to overrule legislation “repugnant to the laws of England.” And it is often the relatively liberal regimes that introduce Islamist provisions, like Egyptian President Anwar Sadat did in the country’s 1971 constitution, probably in an attempt to consolidate power and legitimize themselves before conservatives. Nonetheless, as the rash of revolution in the Middle East is sure to be followed by a rash of constitution drafting, it’s important to know the crowd-pleasers, like acknowledging Islam to be the religion of the state, from the more serious clauses that require all legislation or judicial decisions to have religious approval. Imagine if Goldilocks were to go constitution-picking. She would settle on something not too theocratic, not too secular. In the Muslim world, that may be just right. Idrees M. Kahloon, ’16, a Crimson editorial writer, is an applied math concentrator in Dunster House. His column appears on alternate Fridays.